Cottage on 5 Acres & Contents Absolute Auction — Harritt Group, Inc. Private 5 acre retreat with cozy English style cottage and summer house located off scenic South Skyline Drive in Floyds Knobs just minutes to downtown selling absolute to the highest bidder without reserve. Also selling onsite a vintage pickup truck, furniture, coins, household items plus two generators and wood stove. 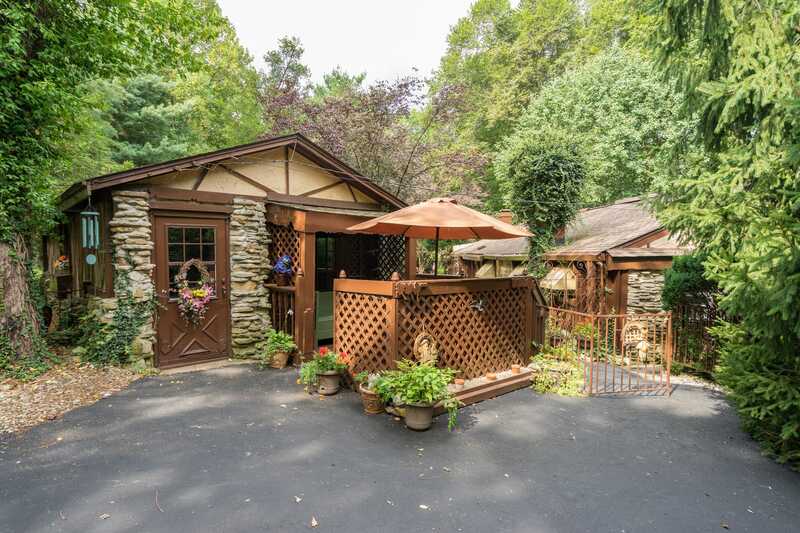 1920’s English style stone & stucco cottage plus outbuilding on 5 beautiful wooded acres located on a private road in a small neighborhood just off scenic South Skyline Drive in the Knobs. This unique property surrounded by mature trees and perennials offers retreat like serenity and privacy while still being close to the conveniences of city living with a spectacular view from your road entrance of Southern Indiana. Home to the Harbison’s for over 45 years the property includes 1138 square foot home with 2 bedrooms, 1 bath, equipped eat-in kitchen, living room with fireplace, laundry room, enclosed front porch, sunroom with french doors and adjacent wood deck, small utility basement plus adjacent 16’ x 26’ summer house built in 1948 on 165’ x 1320’ lot with circular drive. Great opportunity to own a private 5 acre retreat selling absolute to the highest bidder without reserve. 10% Non-refundable down payment day of auction, balance due in 40 days. Buyer to assume real estate taxes due and payable May 2018. Possession immediate at closing. Selling as is with no contingencies, all inspections welcomed prior to auction. 1991 Chevrolet S-10 regular cab long bed pickup w/ 4.3L, V-6 engine, 129K miles. Entertainment center, oversized ottoman, coffee & end tables, wingback chairs, 4-piece bedroom suit, dresser, meat cutting table, (2) bar stools, wine/bakers rack, 1920’s swivel office chair, wormy chestnut storage box, wood gumball machine, vintage bottles including Renn New Albany, carved wood trains, Union Pacific RR brass spittoon, powder horn, cowboy bunkhouse mirror, horsecollar and tack, single trees, buck saw, Hopalong Cassidy glass, Avon, Coca Cola wall hanging & glassware, bar supplies, large asian oil painting, treadmill, Bowflex exercise machine, iron tractor wheel, cast cookware, nail keg, dinnerware, books, lamps and more. All Power 6.5HP- 3500 watt propane fuel generator, All Power portable 1000 watt generator, fancy 30”h x 16”w x 20”l cast iron parlor stove w/nickel accents, kerosene heater w/electric fan, window air conditioner, cherry paneling, walnut boards, brass steam valves and more. 1894 Morgan Silver Dollar with certificate of authenticity, 1883 Morgan Silver Dollar and 1922 Peace Silver Dollar in special 2 pack “Two Centuries of U.S Silver Dollars” collector set with certificate of authenticity and 1945 Mexican peso gold coin. I-265 to State Street or I-64 to Hwy. 150 to Paoli Pike to Scottsville Road. 3/4 mile to right on St. Mary’s Road to slight right on Spickert Knob Road. 1.2 miles to straight onto South Skyline Drive (at top of Spickert Knob Road). 1/2 mile to left on John Wrege Road. 400’ to auction on right.